Planetary scientists can model the distribution of the debris left along the orbital paths of periodic comets and asteroids accumulates over repeated passages, and planetary scientists can model its distribution. The Meteorshowers.org website features an interactive 3D rendering of the models. In the upper panel, all major debris fields are shown, along with the color-coded orbits of the planets (Earth is bright blue). The lower panel shows the debris that produces December's Geminid Meteor Shower, and an asteroid named Phaethon. Earth (the blue dot at the right end of the orbit) is shown a few weeks before it passes through the debris field, which enters the inner solar system from above and exits below right. As we traverse the cloud, our planet's gravity attracts the particles, and they burn up as "shooting stars" while falling through Earth's atmosphere. The particles can enter at speeds of 25,000 to 160,000 mph (40,000 to 256,000 km/h), and the kinetic energy of each particle ionizes the air molecules it encounters, leaving a long trail of glowing gas that is less than a few feet wide but many miles long. Most trails occur in the thermosphere, the region of the atmosphere situated between about 50 miles and 75 miles (80 to 120 km) above the ground. Slower meteors need to reach the denser atmosphere at lower altitudes before forming a trail. As viewed from Earth's surface on a clear, dark night, these trails glow briefly as they streak in front of the distant stars. The colors that meteor watchers see come from a combination of factors. Red light is emitted by the glowing air molecules. Meteor material itself is burned up during its high-speed passage. Oranges, yellows, blues, greens and violets are produced when minerals — such as sodium, iron and magnesium — in the particles are vaporized. Scientists can analyze the spectrum of color in a meteor trail to determine the composition of the material. If anything makes it to the ground, it becomes a meteorite. An easy way to remember the difference is to recall that many rock names end with "ite," like granite. The duration of a meteor shower depends on the width of the zone — that is, how many days or hours it takes Earth to pass through it. A meteor shower commences on the date when Earth first enters the debris field. The shower then builds to a peak when Earth passes through the densest portion of the cloud, and then tapers off, ending on the date when the planet exits the zone. The inherent brightness of the meteors is dictated by the average size of the grains in the cloud. Some showers are known for having fewer but brighter meteors, while others are dimmer but much more prolific. Most showers are global events, but certain showers are better for observers in either the Northern Hemisphere or Southern Hemisphere depending on whether Earth is riding high or low through the cloud. Meteor showers are named for the constellations Earth is heading toward as it passes through the debris field, causing the meteors to appear to radiate from that patch of sky. Astronomy apps such as SkySafari 5 display the radiant for the meteor shower against the distant background stars. When the radiant is low, Earth will block many meteors from view, so the best time to view them is when the radiant is high in the sky or overhead. Several factors affect how many meteors you will see during a particular shower. For one, if Earth happens to traverse the densest part of the cloud while it's daytime, you'll be looking the night before or after the peak, somewhat reducing the numbers. Because most meteors are quite dim, a dark sky is essential to see them. Unfortunately, the moon can ruin an otherwise terrific show. The new-moon phase, when the moon is near the sun and the side opposite Earth is illuminated, leaves the night sky dark. First-quarter moons set in early evening, and last-quarter moons don't rise until the wee hours, so meteor hunters can work around them. Full moons stay up all night and can completely spoil a shower. Thankfully, phases of the moon vary year to year, so every shower gets good years and bad. Your astronomy app will tell you the phase of the moon at the peak of each meteor shower. Take a look at all of the dates around the peak to find nights when the moon is less of a factor. Try to find a dark viewing location that has as much open sky as possible. Light pollution washes out the night sky, dramatically reducing the number of fainter meteors you will see. So it's helpful to drive to a park or rural site away from city lights. To preserve your eyes' adaptation to the darkness, remember to turn everyone's mobile device screen brightness to minimum or, even better, cover screens with a red film. Disabling app notifications will reduce the chances of unexpected bright light, too. You can start watching as soon as it's dark. While the peak number might occur closer to dawn, meteors will be visible before midnight, too. Don't worry about looking directly at the radiant. Bring a blanket and a chaise to avoid neck strain. And remember that binoculars and telescopes will not help; their field of view is too narrow to catch the streaks appearing all over the sky. If you have friends or family with you, don't look at them while chatting. Keep your eyes on the skies! 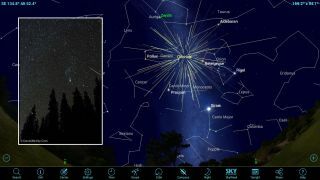 SkySafari 5 and other sky-charting apps allow you to search for meteor showers by name, and they display the radiant location on the sky. The app provides information about the source comet; the start, end and peak dates; and the history of the shower and source. You can adjust the app's time to find out when the radiant will be above the horizon for your location. As a supplement to sky-charting apps, you can use dedicated apps to follow showers and count meteors. The free Meteor Shower Calendar app for Android and iOS issues notifications of upcoming showers and includes weather forecasts, moon phases and historical data. The American Meteor Society is a terrific online resource for meteors. The free app for Android shows current meteor and moon information, a summary for the year and sky maps of radiant locations, as well as provides an interactive method to count meteors by aiming your device at the sky and swiping the screen to show the meteor direction. You'll be doing citizen science! The Meteor Shower Calendar app is full of information about these annual events, including duration, peak date and sky radiant position. It also issues notifications when showers are imminent, and lets you record and report sightings. Bright moonlight will wash out all but the brightest meteors. Each shower receives a rating for the current year based on the moon's phase on the peak of the meteor shower, your local weather forecast and the zenith hourly rate of meteors. Here are the major meteor showers occurring between now and January, as well as some tips for when to look for them. Minor showers happen all the time, so it's common to see a few meteors on any dark night. The American Meteor Society website lists all of those. The annual Orionid meteor shower, composed of debris from repeated passages of Halley's Comet, runs from Sept. 23 to Nov. 27. It peaks between midnight and dawn on Oct. 21 under a dark, moonless sky. This shower produces 10 to 20 fast meteors per hour, and many of them are bright. The meteors can appear anywhere in the sky, but they will be traveling away from the radiant above the bright red star Betelgeuse in Orion, which rises in the east after 10 p.m. local time and climbs to its highest point a few hours before dawn. The American Meteor Society's AMS Meteors app describes and tracks upcoming showers and the moonlight's impact on them. The app includes an interactive reporting system (lower right) that uses your device's sensors to record and report meteors, which lets you contribute to science! The Northern Taurid meteor shower, a modest one with only five meteors per hour at its peak, is active from Oct. 19 to Dec. 10, and peaks overnight from Nov. 11 into Nov. 12. These are medium-speed meteors derived from material left by periodic Comet 2P/Encke. They consist of larger-than-average grains and often produce colorful fireballs. During the peak, the radiant point is near the Pleiades cluster in Taurus, and reaches its highest point at about midnight. At the peak, the moon will be a waning crescent that's 34 percent illuminated and will rise in the middle of the night, so Nov. 11 will be a better evening to view this shower. The Leonid meteor shower runs from Nov. 5 to Dec. 3 and peaks before dawn on Nov. 18, when the radiant point, which sits within the sickle that forms the lion's head in the constellation Leo, rises in the east around midnight and climbs highest at dawn. These meteors are produced from material left by Comet 55P/Tempel-Tuttle. Leonids are typically fast and bright, with many having persistent trains. The expected peak rate is approximately 15 per hour. A new moon will provide a dark sky for meteor watchers. The Geminid meteor shower — usually the strongest meteor shower of the year, with up to 120 meteors per hour at the peak — runs from Nov. 30 to Dec. 17. It peaks overnight on Dec. 13 into Dec. 14. The radiant point is near the bright star Castor in the constellation Gemini, which climbs highest around 2 a.m. local time. The Geminids are often bright and intensely colored, and move more slowly than average. Unlike most meteor showers, the source material is thought to be an asteroid (called 3200 Phaethon), not a comet. This means that the debris is likely larger and more solid — giving us a better show. This year, the moon during the peak will be a waning crescent that rises at about 3 a.m., so the best time to watch will be in the hours after midnight. The Ursid meteor shower is a short and modest meteor shower that peaks on the morning of Dec. 22, but you can look throughout the night because the radiant, near Polaris in Ursa Minor, never sets. The debris causing the shower is derived from Comet 87P/Tuttle. At the peak, in a dark sky, skywatchers can expect to spot five to 10 meteors per hour, and the moon will be a young crescent that sets in early evening, leaving a lovely dark sky for meteor hunters. The Quadrantid meteor shower, which runs from Dec. 28 to Jan. 12, peaks before dawn on Jan. 3. Unfortunately, a full moon will spoil the show. The source material for these meteors is an asteroid designated 2003 EH. The average hourly rate is about 25 meteors, but during the short, intense peak period, you might see more than 120 per hour! The Quadrantid meteor shower is named for a former constellation called Quadrans Muralis (the Mural Quadrant), which used to be located in the northern sky between Hercules and the tip of the Big Dipper, so the radiant is off the end of the handle of the Big Dipper. Amateur and professional meteor watchers record the number of meteors each hour during the shower period. These two graphs show the counts for past Orionid and Perseid meteor showers. As with any observational science, the data sets have degrees of uncertainty, and possibly some erroneous measurements, as indicated by the vertical error bars and the outlying data points, respectively. The vertical dashed lines are separated by one week. You can see that the Perseids produce several times more meteors than the Orionids, and that the peak of the Perseid shower is narrower and more intense, indicating that its debris cloud is both denser and narrower in cross section in space. Mark your calendar for next summer's Perseid meteor shower, which lasts from July 13 through Aug. 26 and peaks on the weekend of Aug. 11. This is already one of the best showers of the year, occurring during warm summer nights and producing 60 to 80 meteors per hour at the peak, many manifesting as bright, sputtering fireballs. But the 2018 Perseids peak during a new moon, giving us several nights of perfect viewing conditions. Book your vacation to a place with dark skies, and enjoy the show! In future editions of Mobile Astronomy, we'll talk about how astronomers map the sky, dive into the Andromeda galaxy, and more. Until then, keep looking up!